OTTAWA, Nov. 9, 2015 /CNW/ - As failed states, conflict, natural disasters, famine and epidemics continue to plague the globe, Canada will increasingly be called upon to render Humanitarian Assistance and Disaster Relief (HADR) to those affected. The Resolve-Class Auxiliary Oiler Replenishment ship will play a key role in the Royal Canadian Navy's HADR efforts from 2017. While the primary role of the Resolve-Class AOR is to conduct underway replenishment for the Canadian Task Group and other allied warships, a significant number of design elements have been incorporated into the ship's design to support the HADR mission. Spencer Fraser, CEO of Project Resolve today commented "We are extremely proud to be able to fill the current gap and provide Canada with a strategically enabling naval asset for HADR missions. 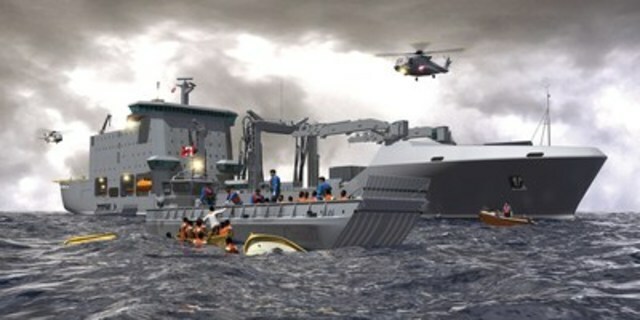 We incorporated HADR requirements into the ship's design from the very start and we are confident that the ship and its Canadian crew will successfully meet the Government of Canada's goals of providing effective and responsive humanitarian and disaster assistance where and when called upon." Davie Shipbuilding - Voted North American Shipyard of the Year 2015 by Lloyd's List - celebrates its190th anniversary this year. Davie is Canada's largest and highest capacity shipbuilder and industrial fabricator. Davie provides a broad range of products and services to industries from offshore oil & gas to defense.